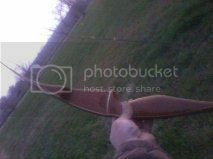 About a month ago, while driving through town, I came across a yard sale that had an old bear grizzly recurve and I picked it up for 10.00. 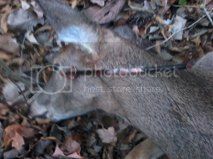 After getting a string on it, and shooting it quite a few evenings, I really wanted to take a deer with it. I normally hunt with a thunderstick III, but was determined to get it done before this season ended with the grizzly. Well, this evening I went to a spot I had picked out where two deer trails intersected before going into an open field, and hunkered down behind a cedar blow down. 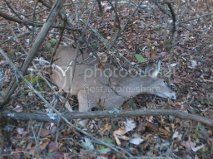 Wasn't there for 5 minutes, when I doe came blazing in with a nice buck in hot pursuit. Thought I would leave the buck for my son to get a crack at, and stuck the doe from 8 yards out. Pics aren't very good, took them with my cell phone. Now it's time to go back to the longbow. Thanks for looking. Gotta love it when a plan comes together. Now if your son can get that buck it will be complete. Congrats brother. Well done. Enjoy the feast and I hope that your son is successful on the buck! "The measure of your life will be the measure of your courage." I love the old bear Grizzlies. Congrats on the great yard sale find and the Nice Doe! Congrats on the bear kill, I have a 69 grizzly that I plan on using this season, hope my results mirror yours. Some dude with a stick and string chasing things.